Finally, I can announce on the launch of a new feature, that was long being in the making. Paid blog posts. Why?! Because blog posts are one of the best ways to get a back link. They are natural looking links, embedded into relevant text, and if you choose correctly, within a blog that relates to your niche. If the blog is good, and the post, it is almost impossible for Google to differentiate a paid blog post from a natural (real) blog post. That makes it so appealing to SEO, that you just can’t resist it. We assimilated about 10,000 blogs, in multiple niches, that could serve you. All those blog post provide a do-follow link with an anchor text and target URL of your choice. Not only that, but you have all the blogs, come with the score for the blog from Majestic SEO, which includes Trust Flow and Citation Flow (scores for the reliability & popularity of the blog) , so it makes it easier to pick the right blogs. Then, you just need to pay, and we’ll take care of the writing of the post and the communication/payment to the blog owner/admin. So, the entire process is easy and reliable. Good link building never been so easy! Select the category or use the free search Note that the number you see in parentheses is the amount of blogs in the category. The directory icon links to sub categories under this category. 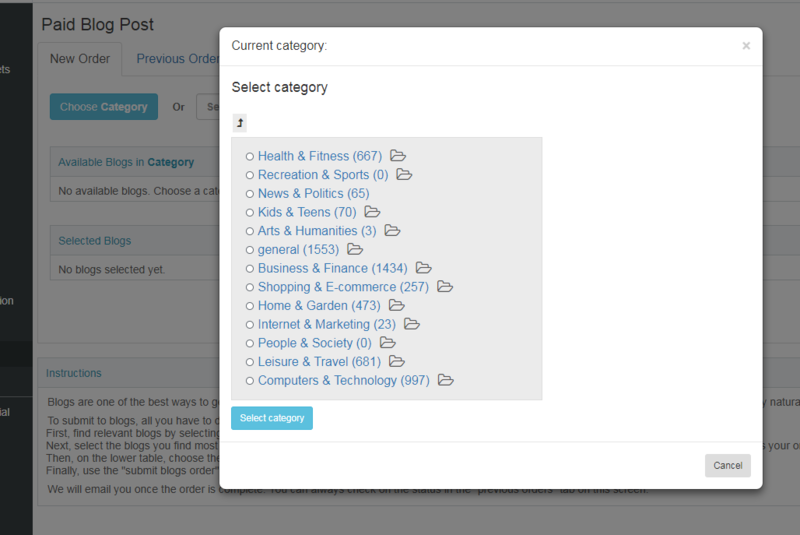 Once you select the category, just click it and press the “select category” button. 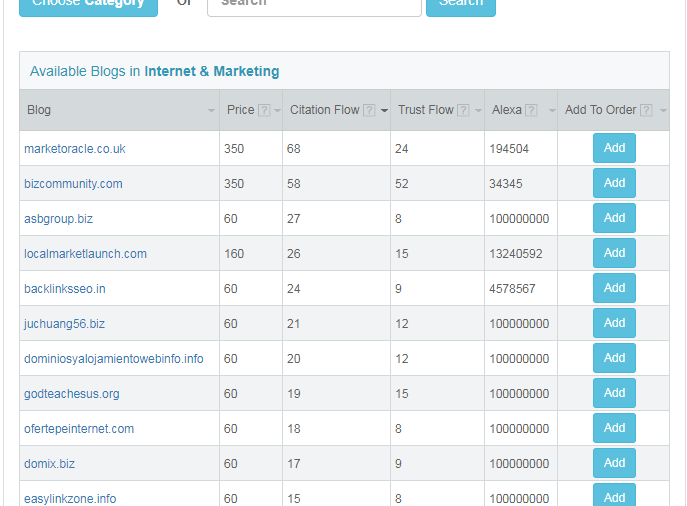 As you can see above, you can see for each blog, the price, citation flow, trust flow and Alexa scores. You can also sort the list by each of those fields. To add a blog to your order, use the “add” button next to it. It will then be added to the lower table (see below) of chosen blogs. Once you’ve finished selecting the blogs, scroll down to the lower table and have a look at your chosen blogs. If you don’t like any of them, just remove it from the order using the “delete” button next to it. For each selected blog, you need to set the target URL, which is where the link will point to within your website. Also, you’ll have to set the anchor text, this is the text that will appear on the link to your website. It is a vital part of SEO, so you should try to provide the keyword you want to promote. Once you’re ready, just press the “submit blogs order” button. That will forward you to the payment screen. Once the order is paid for, you’ll get an email once the post is ready. 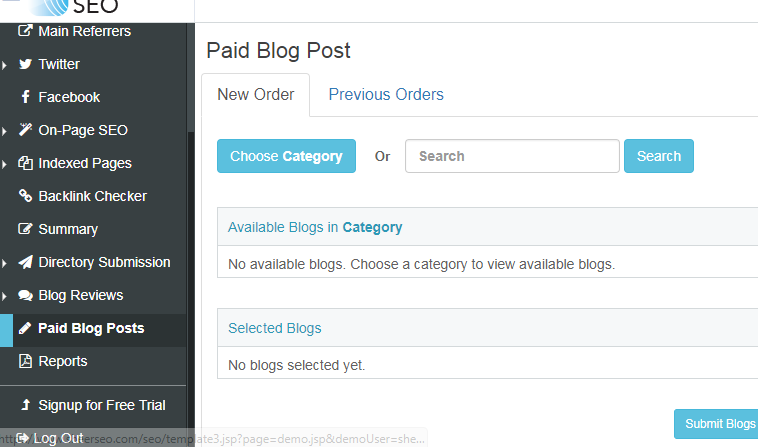 You can also check the progress and find the post in the “previous orders” tab of the “Paid Blog Posts” screen.